This is one of those recipes that a friend at work shared with me many years ago. Prior to that, I only used my slow cooker to make beans, stews, and spaghetti sauce. This recipe was so simple that I had to give it a try. You begin with a roast. I have made this recipe with pot roasts that are as big as 5 pounds and as small as 2 – 3 pounds. I usually do this with a chuck roast, but have also used bottom round. Basically, I buy whatever is the cheapest cut of meat I can find that is roughly in the shape of a roast. You need to sear the meat on all sides just to get a little carmelization on the surface. (I confess that I sometimes skip this step, and things have turned out fine, but my mother always said that you needed to brown a good piece of meat before baking, so the rule probably applies to slow cookers, too.) I don’t season the meat before doing this because there is plenty of salt and flavor in the other two ingredients being added to the slow cooker. 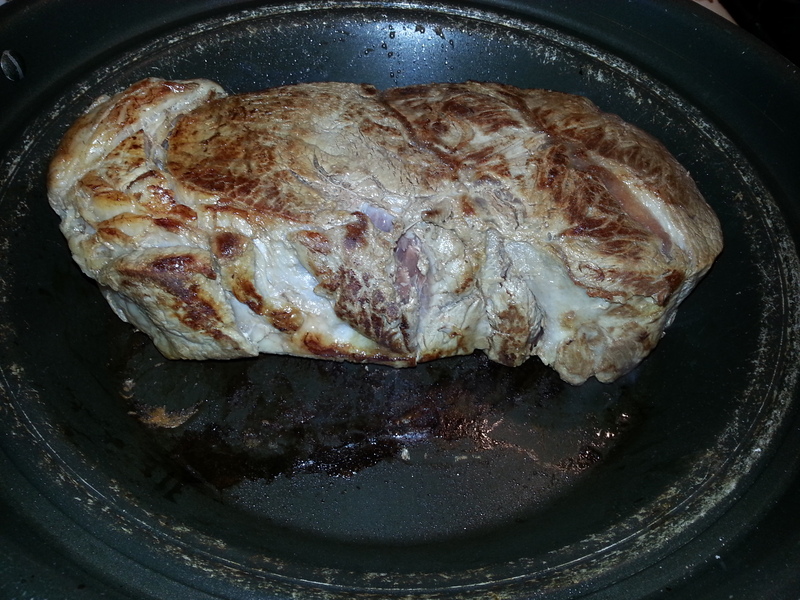 Make sure that you use your tongs to hold the roast on it’s side for a while to get the edges browned, too. You are not completely cooking the roast, just browning it. Do you see all those brown bits in the bottom of the skillet. They are loaded with flavor. Do NOT throw the pan in the sink as soon as you remove the roast. Remove the roast and insert it into your slow cooker. I realized that I should have gotten out my larger slow cooker, but I was feeling lazy, so I just folded it in half and shoved it into my Crockpot. 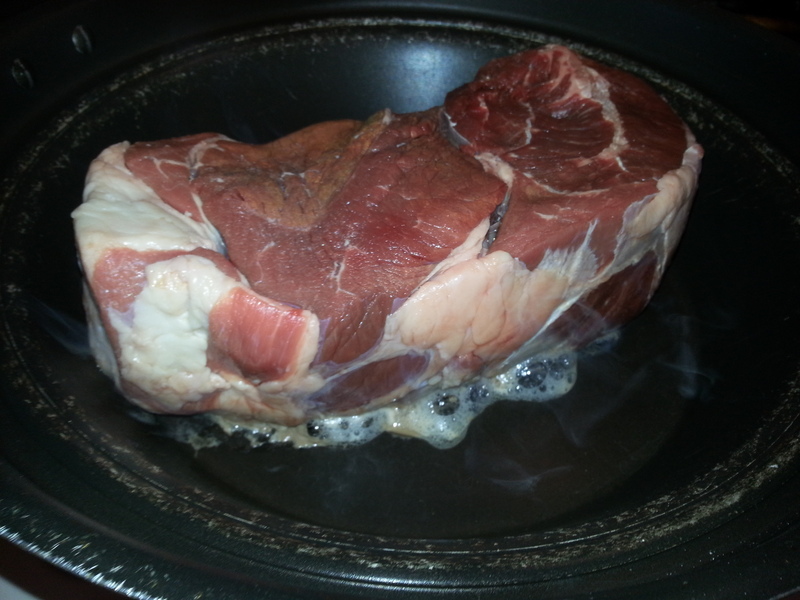 Add 1./2 cup of water to the pan in which you browned the roast and stir it around. Most, if not all of the brown bits on the bottom of the skillet will be released in to the liquid. It will look gross, but I promise you that it’s full of delicious flavor. Turn of the stove and keep the skillet handy. Next sprinkle a packet of onion soup and dip mix over the roast. Sometimes, I use a packet of mushroom onion soup mix. Both are good. This is topped with a can of your favorite cream of soup. I recommend cream of mushroom, cream of celery, or cream of onion. Most of the time, I use cream of mushroom unless someone is dining with us who is allergic to mushrooms, then it’s cream of celery. Finally, the water and bits from the pan are poured on top. (Sorry, My camera didn’t focus correctly and I didn’t realize on the small screen.) 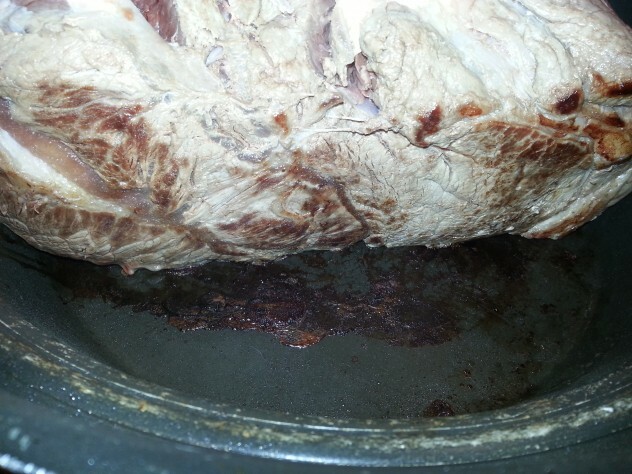 Put the lid on the crock pot, turn it to low, and ignore it for 8 to 10 hours. When you remove the lid, you will find something that looks like this. I know, it’s not very pretty, but wait. 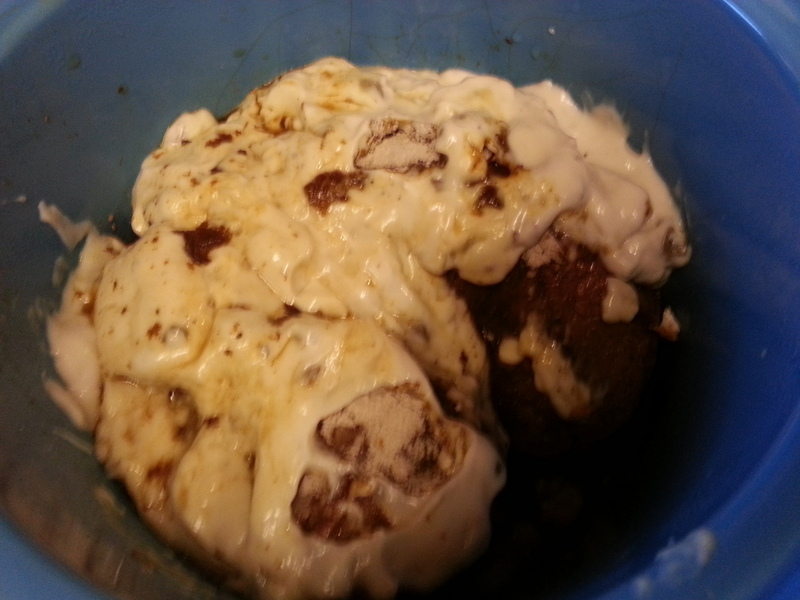 Don’t judge this recipe by its hideous appearance. Using tongs, I fished out my roast. It broke into three pieces. It was beautiful, moist, and juicy. I gave the remnants in the pan a good stir and it looked presentable. The gravy left in the pot was what my friend, Jerry, always called “wild” gravy which meant that it was very loose and ran all over your plate. If you want to thicken it, add 2 tablespoons of flour with 2 tablespoons of water. 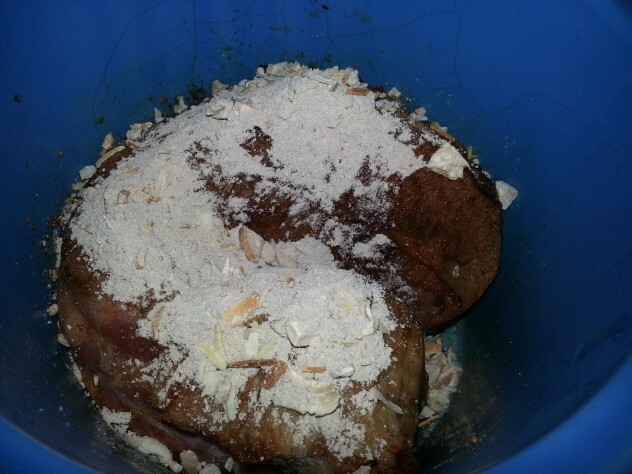 Turn the crock pot to high and stir in the flour and water mixture. Let it cook for about 5 minutes. Personally, we like the “wild” gravy. All you need to do when you get home from work is make a couple of side dishes. Make it really easy on yourself by serving instant mashed potatoes and a salad from a bag. Dinner can be on the table in a few easy minutes. To cut down on the work you need to do in the morning, the entire dish can be assembled in the inner container of your Crockpot and stored in the removable ceramic container in the refrigerator overnight. In the morning, all you need to do is put the crock into the slow cooker when you first wake up and let it sit for a few minutes. (I do this because I worry about the crock cracking as the cold ceramic is heated.) Right before you leave, turn on the cooker to low, and you will come home to a house that smells like this delicious entrée. Give the recipe a try and let me know what you think. Thanks for visiting Patty Cake’s Pantry. 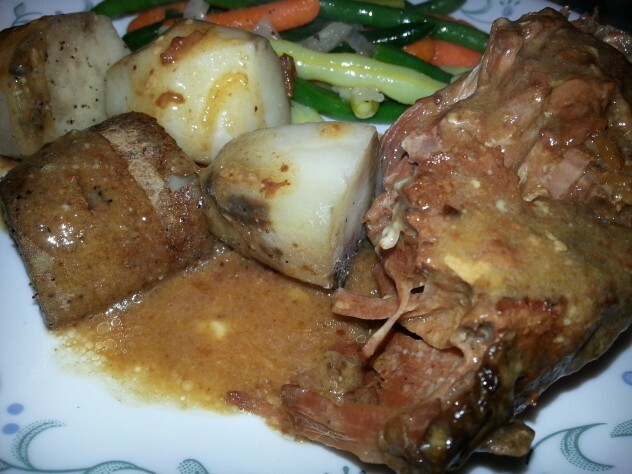 Three ingredients make an easy and delicious slow cooked roast. ½ cup water, to de-glaze the pan. Brown Roast on all sides in a hot skillet. You are only carmelizing the exterior, not fully cooking the roast. Add ½ cup water to the pan in which the roast was cooked and stir, bringing water to a boil to release all of the brown bits into the water. This will add flavor to your roast. Sprinkle the packet of onion soup mix on top of the roast in the crock pot. Pour the can of cream of mushroom soup over the top of the roast. Add the water from the skillet on top of this. Place the lid on the slow cooker and turn on to low. Allow to cook for 8 - 10 hours. It will look very ugly when it's done. That's OK. Remove roast carefully to a plate. It will be very tender and will start to fall apart. 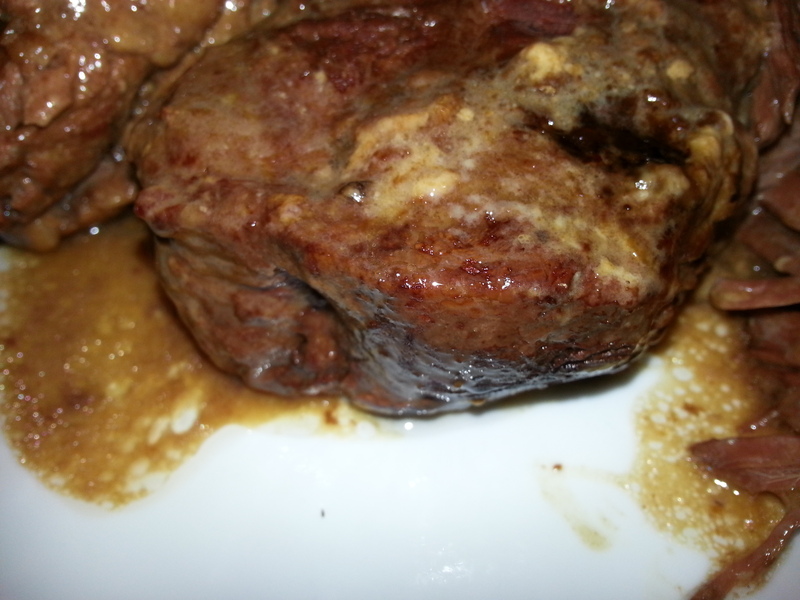 Optional: If you want to thicken the gravy, turn pot to high, mix 2 tablespoons of flour with two tablespoons of water. Add to the crock pot and stir well. Allow to simmer for about 5 minutes or until gravy begins to thicken. Pot roast was one of my mother’s specialties. I’ve made it in the crockpot before, but it has been a long time. I’ll have to try it again. 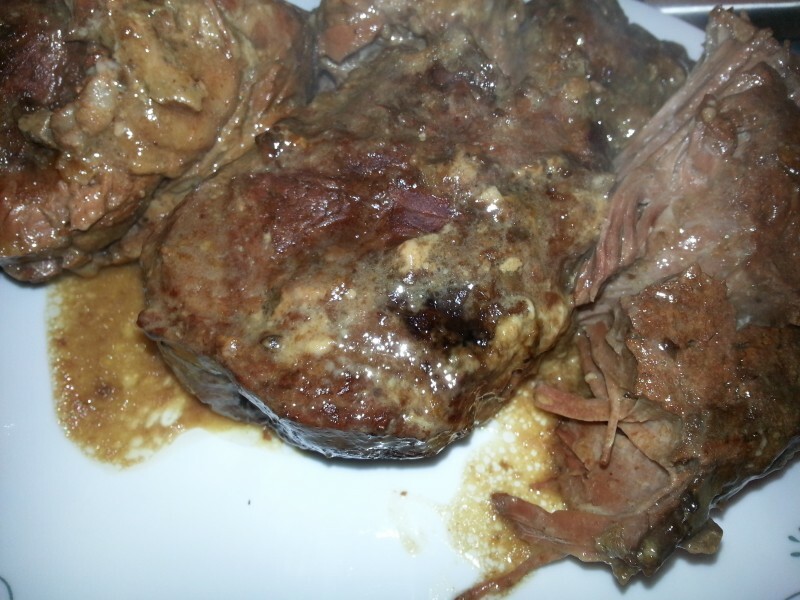 This pot roast recipe was one of the first meat recipes I ever made in my crock pot. I love that I can put the ingredients in the pot in the morning, leave for work, and come home to dinner basically waiting for me. I have no way of knowing what went wrong since I wasn’t there. We have made this many times and it always cooks in the allotted time. 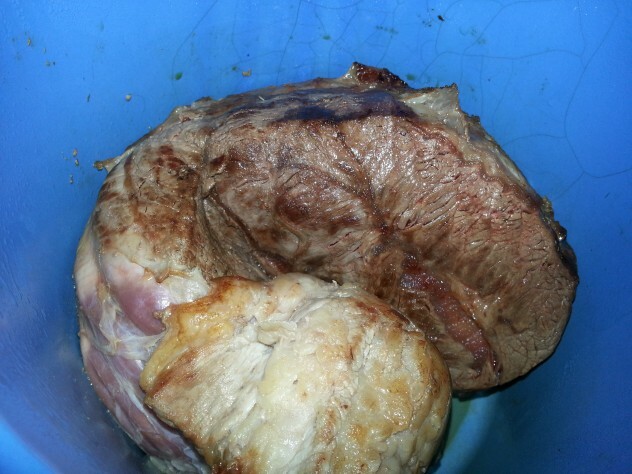 Many factors could have caused the roast to fail to fully cook. Was the roast larger than the one called for in the recipe? Are you certain that your slow cooker is working correctly? 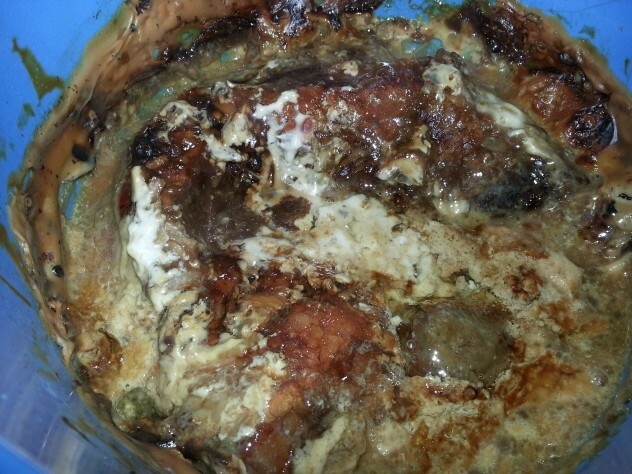 You can put the roast into your oven in a covered pan and bake at 350 to finish it if it’s partially cooked, but if it’s been sitting at room temperature for 9 hours, I’m afraid that the roast is most likely ruined and probably unsafe to eat. We have made this recipe, and it always comes out perfect. I don’t know what the other commenter is talking about. It looks a little disgusting at first, but once you you flip over the meat, remove it, and stir up the sauce, it’s perfect.